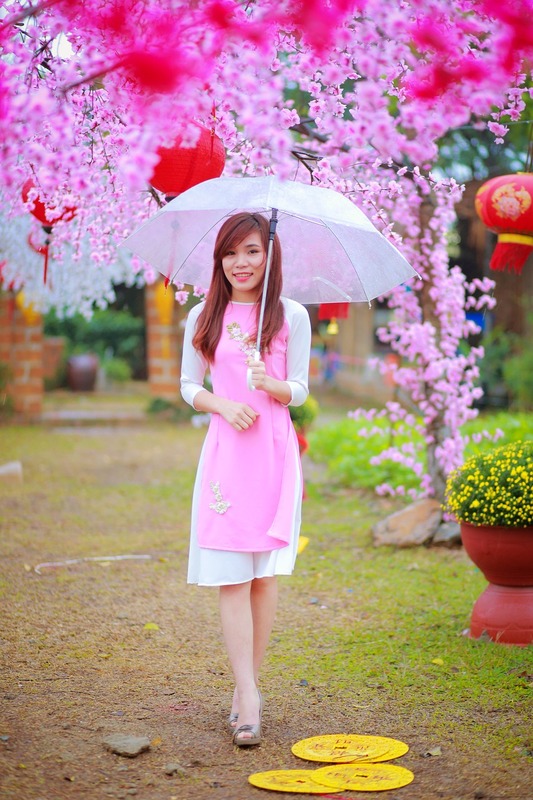 More than often, people interchange the uses of pretty and beautiful. Many a time are when people, in different contexts would not know that the two words have differences. In the end, they end up calling a pretty lady beautiful and a beautiful idea pretty without much of a thought about the variances. As a game changer, you should realize there is a big difference between the two. They might be used in the same way, to describe a person, item, or idea but with a deeper analysis, they will be saying something dissimilar all the same. They will all be meaning that something is looking good on varied parameters. Pretty can take different definitions depending on the subject. When talking of an attractive individual, in most cases a woman or a child, it is said that she is pretty. The adjective, in this case, refers to the person as an attractive one in a delicate way but without being truly beautiful. It could also mean good-looking, appealing, lovely, or nice-looking. However pretty can have other meanings depending on the usage and the variance should be brought out well if the meaning needs to be retained. Pretty may be used to refer to the quality of being pleasing. This is so especially when referring to physical attractiveness and when considering one’s physical features. If a man would say a woman is pretty, then he will have actually developed a deeper liking for her. This would be different from when he says she is fit, fine, or hot which would mean he is not looking for anything much than just talking or a short time fling. In the former case, if the man would describe a lady as pretty, she should rejoice as he is considering her for keeps. Being beautiful is being more than pretty. Online and physical dictionaries carry the definition of beautiful as pleasing not to the eyes but the mind and senses aesthetically. A great example would be to say a poem is beautiful, meaning it pleases the listener of the narration or the reader. It would, therefore, not be the pleasure derived from the structure of the poem or how the artistic considerations have been observed. Rather, it would be purely based on the message. 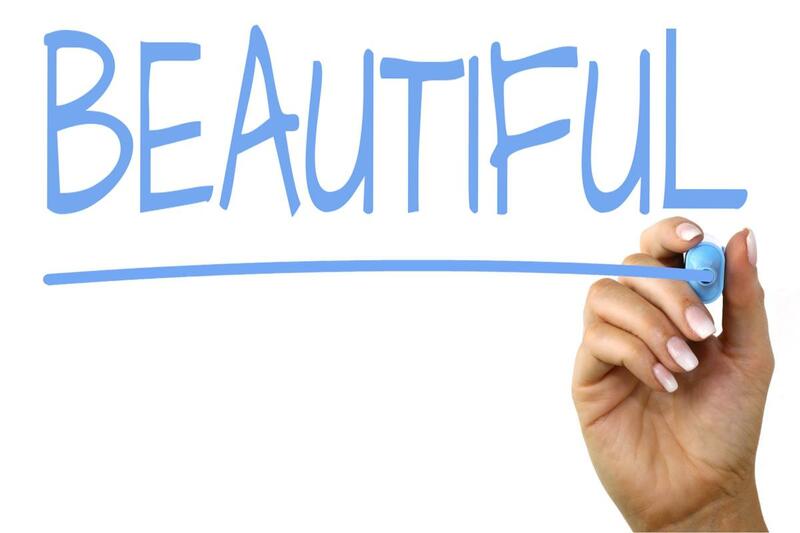 In most cases, beautiful is used to describe a woman. When that is the case, it means the woman has a friendly nature, regardless of whether they are pretty on the outside or not. When that woman’s brain is to go by, she has a smart one. By combining the power of her brain and other qualities, she enchants everyone. A beautiful woman has a nurturing nature. They will most of the times present joy, love, care, passion, and generosity. These are traits that everyone would want around them, and they make the woman beautiful. A beautiful woman commands confidence too. Their accomplishments are way better too. With skills that a pretty woman might not possess, you can never draw a similarity between the two. Being pretty means your outward appearance appeals to people. Beautiful on the other side comes from within. As such, you could be pretty and attract people all the time, but the moment they start acquainting with you, they flee. This only means you do not have a beautiful personality. Being beautiful means being unique while being pretty is more general. A beautiful individual has it easy forming relationships with friends, families, and partners and maintaining it. A pretty person, no matter how they might want to fake it, the friendship will break it. In the long run, pretty and beautiful might be interchanged, but that will be disregarding the rule of grammar. Prettiness, on the one hand, comes from the outside while beautiful on the other comes from the inside. It would, therefore, not be strange to hear someone describe their evil granny as pretty but not beautiful. She might also be not so pretty, but her actions and great deeds qualify her to be called beautiful. Sarah Brown. "Difference Between Pretty and Beautiful." DifferenceBetween.net. 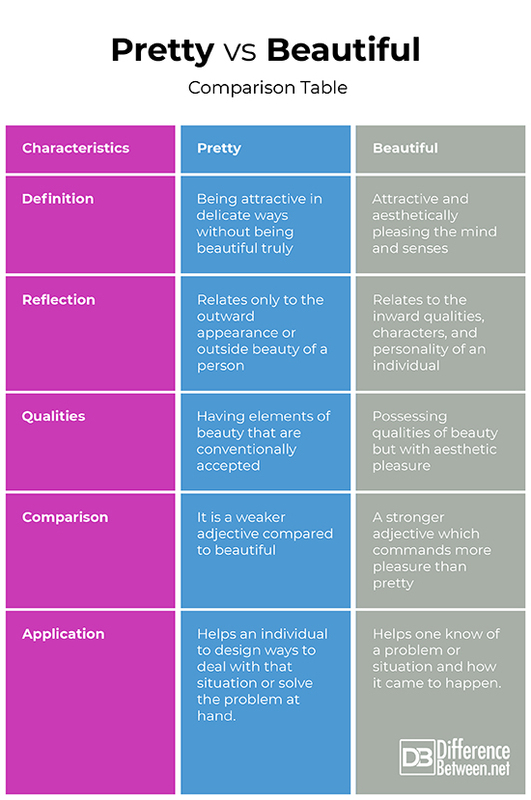 October 4, 2018 < http://www.differencebetween.net/language/difference-between-pretty-and-beautiful/ >. The explanation is clear and helpful. HuffPost. (2018). The Difference Between Being Pretty and Beautiful. [online] Available at: https://www.huffingtonpost.com/teerika-patterson/the-difference-between-be_1_b_3711090.html [Accessed 22 Sep. 2018]. Ojumu, B. (2018). Difference between PRETTY and BEAUTIFUL | Passnownow.com. [online] Passnownow.com. Available at: https://passnownow.com/grammar-clinic-the-real-difference-between-pretty-and-beautiful/ [Accessed 22 Sep. 2018].